Home › Oxycodone Abuse › What Does Withdrawal from Oxycodone Feel Like? Oxycodone is an opioid analgesic synthesized from the thebaine content of opium and marketed under brand name products such as OxyContin, Roxicodone, and in combination products of oxycodone and acetaminophen such as Percocet or oxycodone and aspirin such as Percodan. Oxycodone remains a preferred drug of choice in the opioid abuser populations for its euphoric potencies when compared to some other opioid drugs. “Euphoria and feelings of relaxation are the most common effects of oxycodone on the brain, which explains its high potential for abuse.” according to the DEA. Like heroin, oxycodone is highly addictive and it changes the person’s ability to function physically, psychologically, emotionally, and socially. Too often, it takes control of the user in manners that many of us find hard to contemplate, including the primal fear of what withdrawal from oxycodone feels like. Oxycontin is an opioid analgesic used to treat pain. 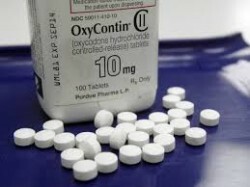 Perhaps the most notorious opioid drug, next to heroin, is the oxycodone brand medication of OxyContin which was introduced in 1996 as a controlled release version of oxycodone with an indicated purpose “For the management of moderate to severe pain where use of an opioid analgesic is appropriate for more than a few days”, according to the FDA. By the time it was on the market for just a couple of years, opioid abusers had realized its powerful effects and ability to produce euphoria similar to heroin when the drug was abused. Massive abuse, addiction, and overdose liabilities of this drug were accompanied by increased diversions of prescription painkillers to the street to support addiction demands and the growing concepts of “pill mills” and “doctor shopping”. More recently, OxyContin has been reformulated to deter abuse by snorting or injecting the drug since it no longer can be crushed into fine powder, retains its time release particles when crushed, and turns to gel if diluted. The horrendous withdrawals associated with OxyContin caused many people to commit violent acts to maintain their habits and many pharmacies withdrew the products from their shelves. With the decline in availability and reformulated OxyContin products, many addicts have switched to heroin or other potent opioid drugs, trying to stave off the much feared withdrawal from oxycodone. Unfortunately, people who use oxycodone for a few days develop a tolerance to the short-acting drug and its alluring effects. Their compulsion to use it more frequently and in higher doses increases their withdrawal from oxycodone severities when they attempt to stop using the drug. The early phase of withdrawal from oxycodone can begin within hours after taking the last dose. Withdrawal from oxycodone depends on the person’s levels of dependency including their methods of use, frequency, and amounts of oxycodone being used. Other factors include biological markers such as metabolism, physical and mental health status and age, and environmental factors that may add to the person’s inability to manage the distress. Chronic abusers of oxycodone tend to have a number of physical, psychological, and social problems that often propagates higher levels of abuse of oxycodone and they are more likely to abuse the drug to fulfill unmet valuable needs. Early symptoms may begin with an unpleasant agitation as the anxiety and anticipation of using the drug again begins to grow. Intense cravings are then, accompanied with excessive yawning, runny nose, teary eyes, chills, sweats, dilated pupils, hypertension, and increased or fluctuated breathing. If the oxycodone is not easily accessible, the person will probably begin to panic, become aggressive and hostile, and lose their inhibitions when it comes to the drastic behaviors they exhibit to try and find more oxycodone. By the end of the first day, nausea, vomiting, diarrhea, abdominal and muscle cramps, weakness, overall body aches and pains, delirium, confusion, extreme restlessness, coordination loss, and insomnia begin to appear and become more pronounced as the time wears on. Combined with exacerbation of the early symptoms, this makes up the acute phase that can last from 3-5 days or longer depending on the various factors mentioned above. Compromised health plays an important role during this time period with the possibility of causing life-threatening conditions. Severe and life-threatening symptoms may include cardiac problems, respiratory problems, coma, seizures, psychosis, hallucinations, and other psychiatric problems requiring immediate medical care. Poly-substance abuse and intravenous injection of oxycodone increases the potential dangers and risks where users have a much greater difficulty in dealing with the stress of withdrawal from oxycodone. People are different and the way they cope with oxycodone withdrawals will be different as well. Many addicts report severe depression and suicidal ideations. According to the DEA, “Individuals who reported past-year symptoms consistent with a diagnosis of opioid dependence were more than twice as likely as never-users to say that they had considered self-destruction.” So it’s no surprise that the withdrawal from oxycodone will feel like the “end of the world” for these individuals. Once the physical symptoms of withdrawal from oxycodone dissipate, the cravings, anxiety, depression, insomnia, and other co-existing health concerns remain. Many oxycodone addicts have a hard time adjusting to sobriety and may become even more depressed or anxious when they are able to put into perspective the consequences of their use. Post acute withdrawal from oxycodone has absolutely no time limits. Unless medical, psychiatric, and the social issues are addressed, there is really not a lot of hope to move forward and relapse vulnerability remains high. Oxycodone Withdrawal Timeline - The symptoms of oxycodone withdrawal can be felt within 24-36 hours after a person's last dose of the drug. These symptoms are physical and psychological in nature, and usually dissipate within a week. In some cases they last for longer.